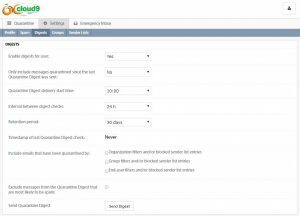 You can adjust your Quarantine Digest Settings by first logging into Cloud Email Protection portal, then by clicking on the settings main tab, and then the Digests sub tab. Specifies the frequency of the quarantine digest delivery. The default value is set to 24 hours but there are options for 12 hours, 8 hours, 6 hours and 4 hours. The quarantine digest is sent out at 10:00 AM local time (depending on the time zone configuration of the company) and at other times throughout the day depending on the interval selected. Preview: This will open the quarantined email in your web browser so you can view it with out having it sent to your inbox. Release: This will release the email and it will be delivered to your inbox shortly. Block: Adds the senders email to your block senders list. Emails from that sender will be blocked from then on.